Like the other species with Stinging Nettle (Urtica dioica) as larval foodplant, Red Admirals can use many types of habitat where the plant grows. 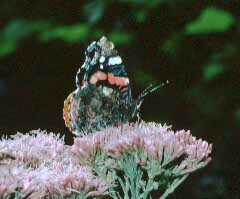 The adult butterflies are often seen in gardens and town parks, taking nectar from flowers. 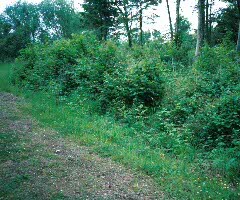 In the countryside they are often seen in woodland and along hedgerows. Rotting fruit attracts Red Admirals, as does sap on damaged tree-trunks. 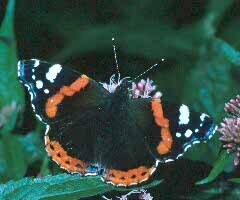 Very few of the Red Admirals which go into hibernation survive the British winter. 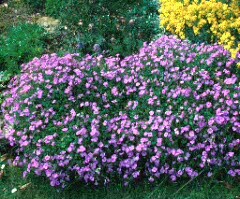 The small population that does survive is soon supplemented by migrations from mainland Europe. The relatively small numbers of overwintering adults and early migrants may be seen from April onwards. 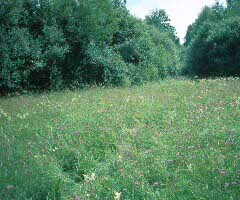 From the start of July the population builds up from further migrants and as eggs laid here earlier in the year result in adult butterflies. Whilst some try to go into hibernation towards the end of the summer, Red Admirals may be seen on warm days late into the autumn.